Seeking funding? Whether you call it summary, plan or a fundraising story, you’ll need to have a well-written overview of your fundraising goals to describe the product or service you’re raising funds for, show your company’s potential and explain how much you plan to raise, Learn how to give investors and stakeholders a well-rounded picture of your organization and raise funds faster with this guide. Create your Fundraising Summary - It's Free! Your starting point to create and share a successful fundraising summary, without any design experience. If your goal is to raise funds – whether you’re a startup, non-profit or charity – your fundraising summary should be comprehensible, easy-to-share and attractive. The layout and style of the summary will depend on why you’re creating this document and who you’re sharing it with. This guide will focus on creating a fundraising summary specific to raising funds for a startup, but this is easily adaptable to non-profits, charities, school projects and other fundraising goals. Use Xtensio’s simple editor to move modules around and restructure the template in infinite ways to make it your own! 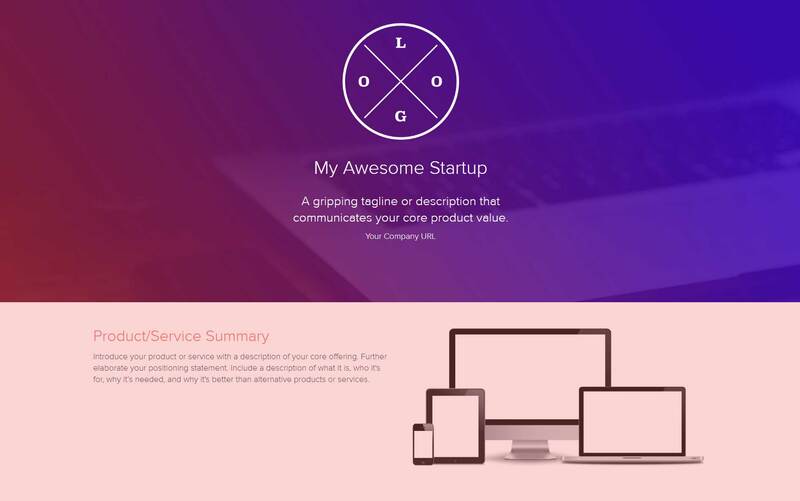 Your idea is awesome and your startup is too! But if you and your team are the only ones aware of this, it’s not going to help you reach your funding goals very quickly. In order to make a good impression while presenting your fundraising summary at an investor meeting, you need to paint a picture of your product or service as innovative and marketable. This starts with what the investor sees at first glance. Follow these simple rules to put your best foot forward and detail your funding goals. 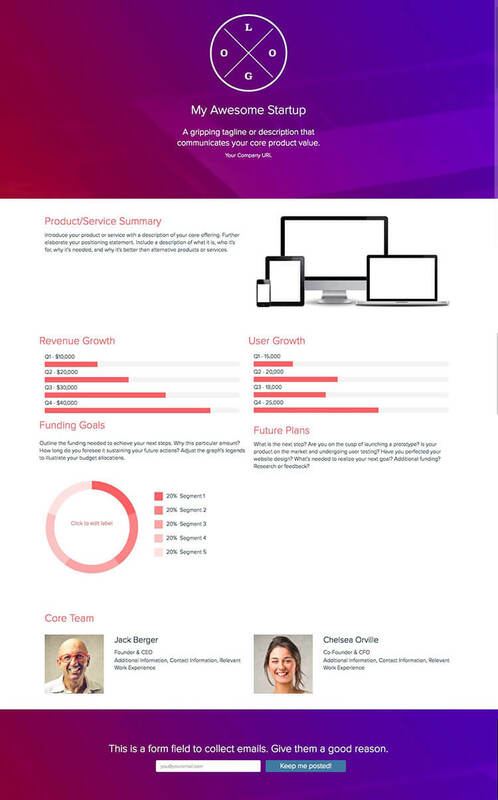 Bonus: If you’re a startup looking to reduce design costs and collaborate with your team on your company’s strategic and visual collateral, take advantage of the free tools and resources in Xtensio’s Startup Toolbox and check out the productivity features on the Business plan. Summarize your product or service with a description of your core offering and a defined positioning statement. Why is it needed in your market? What if your unique value proposition? A mistake that many entrepreneurs make while building relationships with investors (and an important factor in not being able to convince investors) is not showing passion and belief in the product or service they’re trying to raise funds for. If you want others to invest in your business, you need to really show your excitement about your idea and prove that your idea will work. The product summary is the place to clearly outline your passion and dedication to this endeavor. Show that you are a profitable business that would bring a return on investment. Give the investor an understanding of how your overall growth scheme works internally to prove that your team can deliver on time and work to prevent possible roadblocks. Here, you’ll need to outline the amount of funding needed to reach your company’s goals and continue your growth. Make sure that your funding goals are aligned with these overall business goals. You’ll also want to explain why you need this amount to add credibility to your ask. Take advantage of graphs, charts and images to clearly explain what you need and why. What’s holding you back from achieving the next steps successfully? Why do you need this particular amount? Or rather, what will this funding be used for? Are you about to launch a prototype? Does your site need a redesign? Is your product being tested by users? Give details. How long do you expect this amount to sustain your future actions? An important part of describing what you’re raising funds for is showing the people behind the idea. Introduce your core team with a short bio for each. Highlight your team’s passion and dedication to the product and company values. Quick Tip: Having a form field to collect e-mails is useful for learning who is interested in funding your idea. Once you fill out Xtensio’s fundraising summary template, share it as a responsive weblink with potential investors so they can leave their email address if they’re interested in receiving more information. That being said, give them a good reason to sign up! The funding amount you’re seeking will probably change over time. You should update your summary regularly to make sure all your team members and investors are on the same page. The fundraising summary template is adaptable just like other Xtensio tools. It can and should be repurposed, revisited, and revised to suit your evolving needs. You can duplicate your folio to easily get started on the next one or save it as a template. And remember, all of our templates are meant to be starting points. You can always add, delete, and move your modules and sections around with Xtensio’s versatile editor to adapt the fundraising summary to your needs.